Godrej 20 L Convection Microwave Oven (GMX20CA2FIZ) has good features to facilitate easy cooking. It uses a fan and a heating element to make air-flow pattern inside that gives the best browning of the food. This feature is really very helpful for those who are baking cakes, muffins and other likewise items. Further, Godrej GMX20CA2FIZ comes with 40 different recipes just by pressing a single button. It also comes with different cooking modes such as grilling and convection. Using this microwave oven, it is possible to cook everything you want. You can easily perform cooking, defrosting, grilling, roasting and baking very easily. 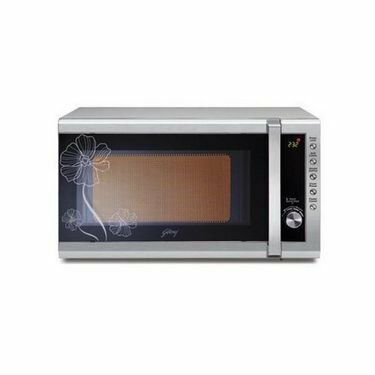 This Godrej GMX20CA2FIZ microwave oven is recommended for a family with 2 to 4 members. This microwave oven comes with one touch cooking solution as it has 40 preset recipes for all your cooking convenience. On the other hand, the multi-stage cooking lets you set up to 3 stages of cooking at a single go.